Secrets Of Terracotta Tiles Revealed ! The first and main way is to look at the edges, straight and uniform, machine made. Glass like Smooth surface and sometimes base, machine made. Another way is the weight, our terracotta tiles are made from a lump of clay being thrown into a mould and spread out to fill the mould evenly. 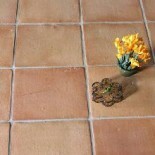 Cheaper tiles are created by filling moulds with a liquid clay which is full of air bubbles therefore our terracotta tiles are heavy because of the dense clay whereas the liquid clay dries and is lighter and more fragile because of the air bubbles that have dried inside leaving a honeycombed tile. Purchase one of our handmade terracotta samples to compare weight for weight. This entry was posted on October 2, 2013 by Living Terracotta in General info and tagged antique tiles, black terracotta, clay tiles, farmhouse floors, handmade terracotta, handmade terracotta tiles, how to fit terracotta tiles, how to lay terracotta.